North of Phoenix, you'll find a green valley with a river running through it. Not far from the red rocks of Sedona, this lovely valley is home to wineries, Native American history, old mining towns and the place where Senator John McCain and his family came to relax and savor the natural beauty. The Verde Valley is located in the areas surrounding Interstate 17 north of Phoenix and south of Flagstaff, Arizona along the Verde River. 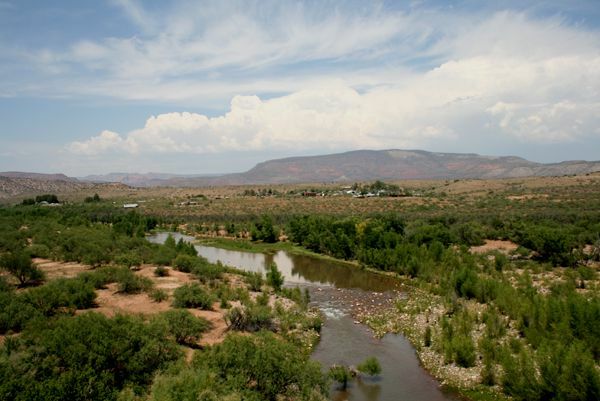 The lush Verde Valley makes for an ideal getaway from the heat of the Valley of the Sun. Visitors love to relax with a picnic, happen upon an eagle's nest, or just soak in the small town atmosphere. Compared to Phoenix, the Verde Valley is sparsely populated with less than 65,000 folks, living on 46 square miles of land. Many small farms and ranches enhance the rural lifestyle. It's a great place to visit for Native American ruins and history. Many don't know about the beauty of the Verde Valley, but Senator John McCain and his family certainly did. The McCain ranch is located in Cornville. Locals say it's up Page Springs Road and is a very large property with immense lawns and shade trees. Oak Creek runs through it. Some refer to the area of McCain's seven-acre property, which is at the end of a dirt road, as Hidden Valley or Page Springs, but because it's within the ZIP code 86325 it's considered part of Cornville. If you want to get a sense of the beauty that McCain enjoyed, visit Page Springs Cellars which is in the vicinity, and sit on their deck enjoying a glass of their excellent wine. The trees will shade you and the soft breezes will cool you off. It's easy to relax and spend your afternoon hours tasting wine and strolling the vineyards on a laid-back tour. You'll follow the Verde River on a leisurely trip on the Verde Canyon Railway. You may see eagles perched on tree branches as you travel through a beautiful canyon. Just in case the eagles are out hunting, often naturalists are on board with birds that you can learn about and photograph. The Verde Canyon Railroad (formerly the Verde Valley Railroad) of Arizona was originally built to support Arizona's richest copper mine, located in Jerome. Now visitors enjoy the Verde Canyon Railway excursions to view the natural surroundings and participate in the railroad's special events. Oak Creek runs through Sedona and provides a bit of the same feel as the Verde River, but Sedona is a completely separate destination. With its famous Red Rocks and mysterious vortexes, Sedona attracts visitors from all over the world and doesn't have the small town country feel of the rest of the Verde Valley. Visitors to Sedona often come to the Verde Valley for a day trip to take the train excursion or go wine tasting. The people that settled this valley came for the water and the rich life along the river. Visitors can enjoy the massive "Montezuma's Castle" cliff dwellings, drive a little farther north and hike in to see Montezuma's Well, and take a side trip to Tuzigoot National Monument with some great ruins to explore and a visitors center. The beautiful Verde Valley of Arizona, with towering cottonwood trees and ever-changing skies, is a far cry from the hustle and bustle of better-known wine areas such a California's Napa-Sonoma Valleys. Travel along northern Arizona's Verde Valley Wine Trail and you will discover some new restaurants and wineries and find yourself slowing your pace and easing into a state of relaxation. There are tasting rooms in Cottonwood and Jerome as well as vineyards to visit. Jerome is a hillside mining town overlooking the Verde Valley. According to AZJerome.com, Jerome was founded in 1876 and was once the fourth largest city in the Arizona Territory but eventually became a ghost town. In 1967 Jerome was designated a National Historic District by the federal government. Today, Jerome is a thriving tourist and artist community with a population of about 450. A great way to wander the streets of Jerome is to attend the town's First Saturday Art Walks and wander through the 20 artists' studios and galleries. There are wine tasting rooms, top-notch restaurants, and old mining history to explore. Clarkdale is a cute little Verde Valley town and is home to the Verde Canyon Railway. Clarkdale is known as the gateway to the Sycamore Canyon Wilderness Area in the beautiful Verde Valley. It was founded as a place for copper miners to house their families. Arizona's Verde Valley is a place to go to get away from the cacti and desert scenery and enjoy springs, streams and lush cottonwood trees. It's a bit different—no big cities, a small town America atmosphere and historical tales to entertain the visitor. See eagles while riding the Verde Canyon Railroad and reflect on the lives of the Sinagua as you walk along the paths of Montezuma's Castle. It's a place to go to relax... to recapture the feel of a more simple time. If you like Wild West history, you'll find it in the Verde Valley. Camp Verde tells the stories of the cavalry and white settlers coming to Arizona and hosts re-enactments. Attractions such as the Out of Africa Wild Life Park and the Verde Canyon Railroad draw visitors. The Verde Valley is a place that you might just pass by as you drive north from Phoenix but it's clearly worth a few days to explore and enjoy. Arizona Wines? Really? Yes, Really.